Notes: This pattern was designed by Mike Mercer of Redding, CA. 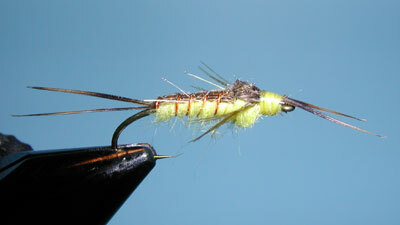 Little Yellow Stoneflies, also known as Yellow Sallies, belong in the Isoperla genus of Stoneflies. They normally hatch between mid-May to August. They are found in many Sierran Freestone streams living in the riffles and runs of moderate to fast flows at mid-to-high elevations. The nymphs can live for 1-2 years within the bottom gravel of the streams. Upon hatching, the nymphs crawl onto shore near dusk time and can be found on rocks and tree trunks. There is one species that does emerge directly in the water similar to a mayfly. During this migration, the Little Yellow Stone nymphs are common in the stream drift and nymph patterns are very effective. Polly Rosborough developed a very good nymph pattern using yellow yarn for the body and Mallard Flank for the Tail, Shellback, Wingcase, and Legs. It is tied with a slender profile, unweighted. Mercer's pattern tends to be an improvement over Rosboroughs' by achieving a more slender abdomen using dubbed Haretron rather than yarn, the use of divided tails and antennaes, and differentiating the wingcase and shellback with different width materials. Mercer's pattern generally uses grouse for the legs, although I substituted Mallard Flank instead. Another Mercer touch, that you might see, is a drop of epoxy on the wingcase which also gives a more realistic representation of this feature when seen underwater. 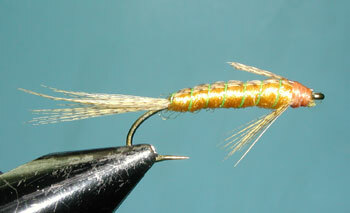 I've shown this pattern under the Poxyback Stonefly Nymph page.